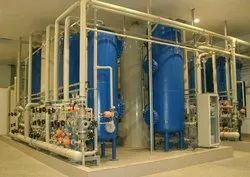 We manufacture and export a wide range of DM Plants that are extensively used in various industries. Widely known for its weather resistance and leak proof ability, our products can be customized as per the specific demands of our clients. We also provide installation training, operation training and onsite support for our DM plants. Continuous research and development activities allow us to offer innovative and reliable Cation Degasser Anions Plant to our clients. It is known for high performance, corrosion resistance and ability to work efficiently in complex conditions.